Last week we took to London to launch our newest collection at Decorex International. Although seasoned Decorex exhibitors in our fifth year, this collection marked many firsts for us as a company - from our first departure from glass into print and pattern with the Ume Lanterns, to our first lights made outside of the UK. This collection has been an exciting journey for both Esther and the team and we are thrilled with the response we have had to it. This year’s stand reflected a botanical theme as Esther’s inspirations from the surrounding Derbyshire countryside shone through into her work. A mix of floral imagery, colours and shapes inspired by Esther’s own garden were brought to life through an opulent silver-stemmed chandelier, Oriental inspired coloured glass lights, and silk lanterns set against the backdrop of Esther’s personally designed wallpaper, ‘Garden is Sanctuary’. Our first venture into silk lighting, this light displays a dramatically printed garden scene featuring ferns and peonies taken from the original paintings and sketches of Esther’s own Derbyshire garden. Read more about the inspiration behind this light here, and find out the product details here. The Fabio chandelier features six hand-blown glass pendants with mirrored stems suspended from a floating mirrored ceiling plate. This luxurious piece was specially blown by Murano glass blower Fabio Fornasier and inspired by a visit of designer and director Esther Patterson, to Fabio’s prestigious Murano glass studio in Venice. Find out more about the Fabio here. 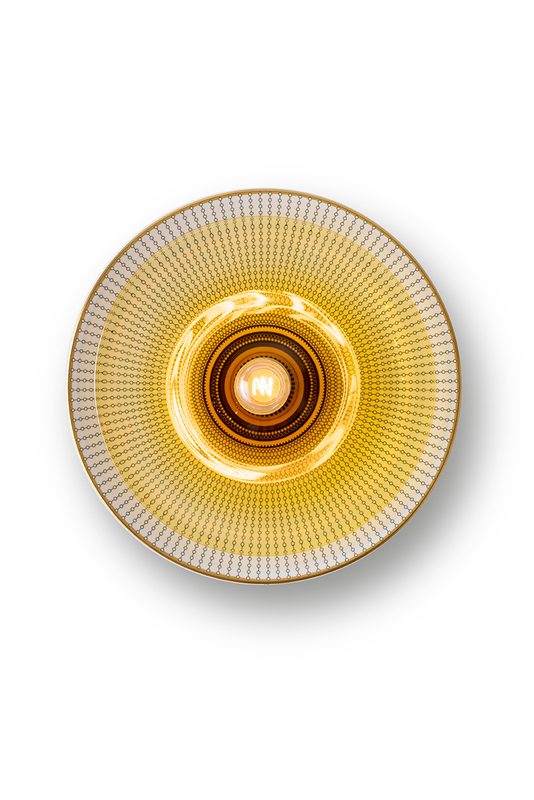 This playful wall light is a striking combination of fine bone china tableware and coloured handblown glass in a mix of traditional and contemporary design - a modern twist on a decorative wall plate that reflects the whimsical style that we are known for. View the product details for the Siren here. Lastly the elegant Japonica wall light takes its inspiration from the Far East with its layered pendant shape and black lacquer wood finish. As well as displaying our own lights at Decorex it was wonderful to see all the new designs coming out from the incredibly talented designers throughout the whole festival. We have featured some of our favourites on our Instagram @curiousastudio. Don’t forget to follow us to see more of our inspiration and behind the scenes stories. Although we are back in the Derbyshire Dales for the time being, we do have our Chelsea showroom permanently open for appointments, and we will coming back to London in November to exhibit at SLEEP + EAT where we will be launching lights made specifically with the hospitality industry in mind.